A while ago there was a bright little spark at Ons Plek. A spark keen to be involved in everything, eager to relate to everyone. A spark who had hope in her heart; who related well to her family but could not stay with them because her family members were either too ill to look after her or too much under the influence to protect her. One night on a visit home a family member entered while everyone was sleeping, kidnapped our sleeping beauty and committed a terrible act. The spark went out, leaving a burnt-out shell who returned to Ons Plek. 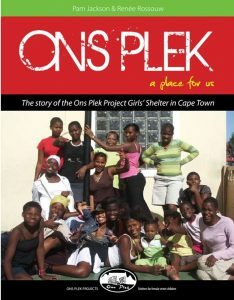 Slowly over the last year, Ons Plek staff have encouraged a very subdued little girl to talk about her pain. The spark has never returned to her, but the shell is less hollow. Writing a story on her life has helped consolidate her being. She is now expected to go to court and repeat her evidence clearly and logically and be subjected to cross-questioning of her timid explanations. Inside her heart are other dead spots. She must close off relationships once dearly held with some family members who are angry, not with him, but with her for laying a charge. A few weeks ago a miracle occurred. When shopping one day the child care worker, Faniswa Muba noticed that the manager’s surname was the same as that of the child. On impulse she spoke to him and discovered him to be the child’s uncle who had recently returned from Europe. She is now living with his family.